You are here: Home / Halloween / DIY Unicorn Frappuccino Costume! 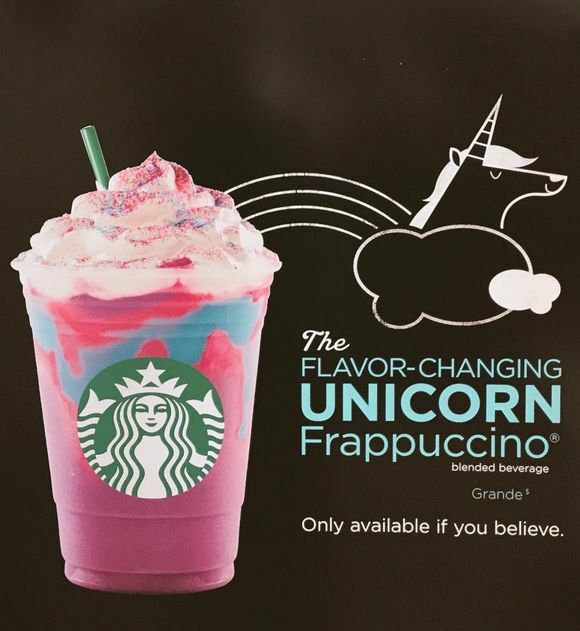 One of the biggest trends this year was the introduction of the Unicorn Frappuccino by Starbucks. Were you lucky enough to get one?! Even though it's no longer on the menu at Starbucks, the Unicorn frap can live on this Halloween … bring it back from the dead with this DIY Unicorn Frappuccino Costume! First, you gotta have a cup filled with mostly pink stuff and some blue swirls. Whipped cream on top is essential. And don't forget the sour pink, purple, and blue sprinkles! A green Starbucks straw for authenticity … or you can get a cute striped straw. The cup has to have a green Starbucks logo. Okay, okay, you can't really use the EXACT logo because of copyright but you can make a green logo inspired by the mermaid. By the way, if you like Unicorn Frappuccinos, try out this yummy Palm Springs inspired date shake recipe! 3 ways to make Unicorn Frappuccino costumes – and why this ONE is the best! I did a lot of research when it came to making this costume and discovered that they are 3 main ways people DIY drink costumes. Some are more comfortable to wear, others are easier to make … but when it comes down to it, the DIY Unicorn Frappuccino costume tutorial I'm sharing is the best, most affordable, easiest option of them all. Size. It can be difficult to find a dress in the right color and in your size. If you're plsu size like me, it's even more of a challenge to find solid colored dresses in the right side when I need one. Color. Let's say you can find the dress in your size … finding a dress that is one solid color is hard. And, who wants to wear a solid hot pink knit dress again? No. Price. You find the dress in the perfect color and in the right size … but it's $100! We've totally had this happen before. Can't wear it again. Like I said about the color, the dress might not be one you want to wear again. You can make all the pieces of costume detachable but the costume can end up looking flimsy or falling apart on Halloween. If you glue the pieces onto the dress, well, now it's just a costume and you can't wear it again anyways. This DIY Costume looks like it will fall apart … good idea but safety pins? Not gonna work! 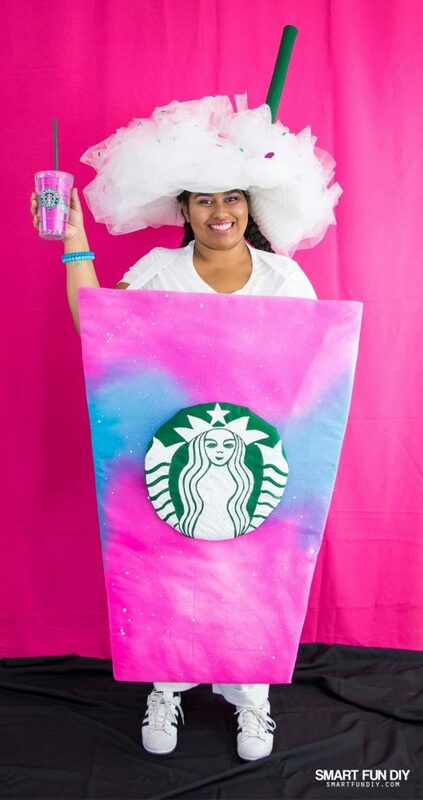 The tube style Starbucks cup costumes have been around for a while … they are super easy to make but really difficult if you have to go to the bathroom or need to move around alot. I imagine getting in and out of the car is kind of hard! Plus, most of them require sewing so they won't fall apart and you'll still need to wear clothes underneath. The costume in this tutorial is a sandwich board style costume … so easy to make! Since the costume sits on front, like a reverse back pack, it's easy to move in and you can take it on and off to go in car or bathroom. Plus it actually looks like a Frappuccino. The supplies to make this sandwich style costume are affordable and easy to find in a general crafts store like Michaels or Hobby Lobby. Unlike most other costumes, you can make this one in any size. And since the base is actually clothing, you can reuse it and wear the items after Halloween is long gone . Wearing real clothes for a costume is also smart when it's super chilly on Halloween night! Love the Frapp? Make this Unicorn Frappuccino recipe! When I started planning this costume, I really thought about ways to make it affordable, quickly, and easily. We've all been there on October 30th trying to DIY up a costume at the last minute because all the stores are sold out of good costumes. I wanted to also make sure that I wasn't sharing a costume that would go in the trash right after Halloween. You can re-make this into a Pumpkin Spice Frappuccino or any other flavor of Frap later. Or even make it into a freak shake or other drink. 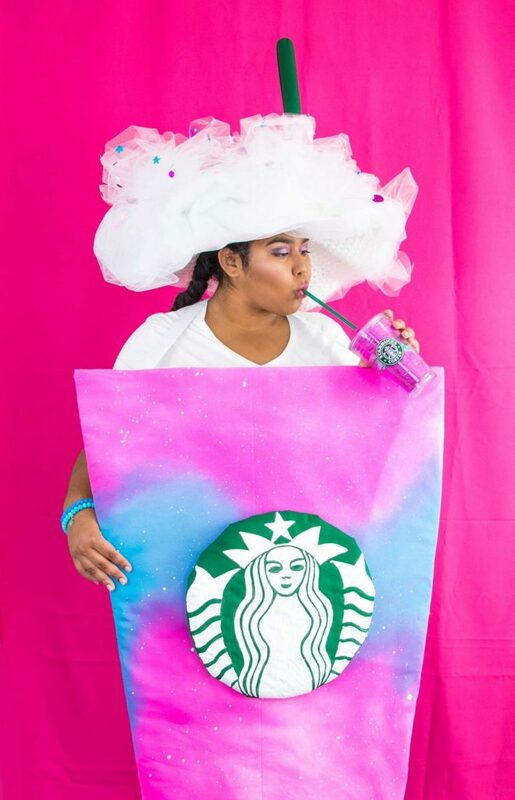 The DIY Unicorn Frappuccino Costume is built on regular clothes as the base so you can pull from your existing wardrobe or grab some cheap white sweats at Walmart. 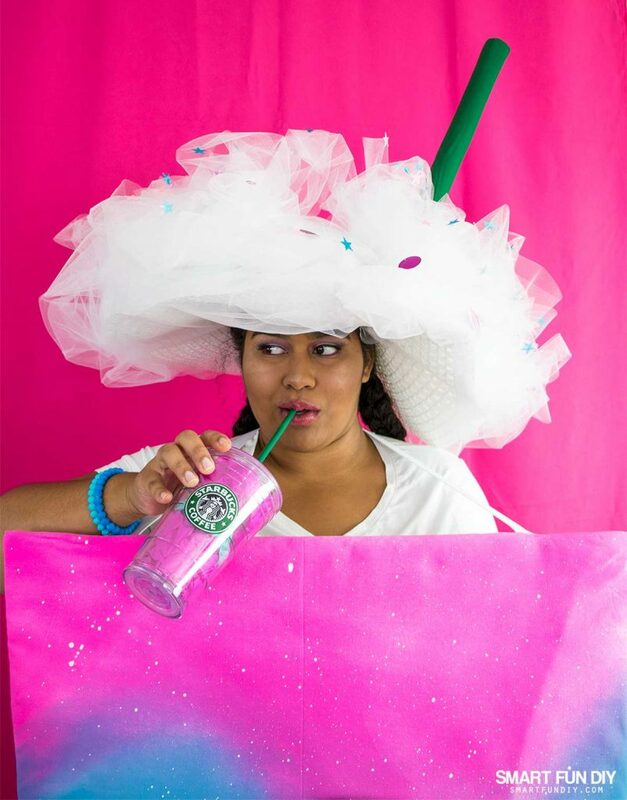 You can find ALL of the supplies to make this DIY Unicorn Frappuccino Costume in local stores like Hobby Lobby and Jo-Ann Fabrics and Crafts. 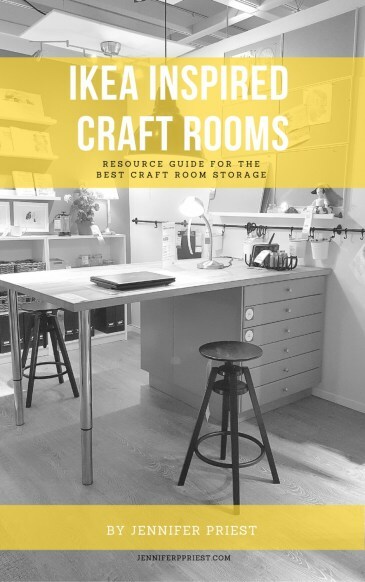 But if you are planning ahead, save yourself some time and order the supplies I've linked below. floppy sun hat – can get these for 25 cents at 99 Cents Only Stores right now! 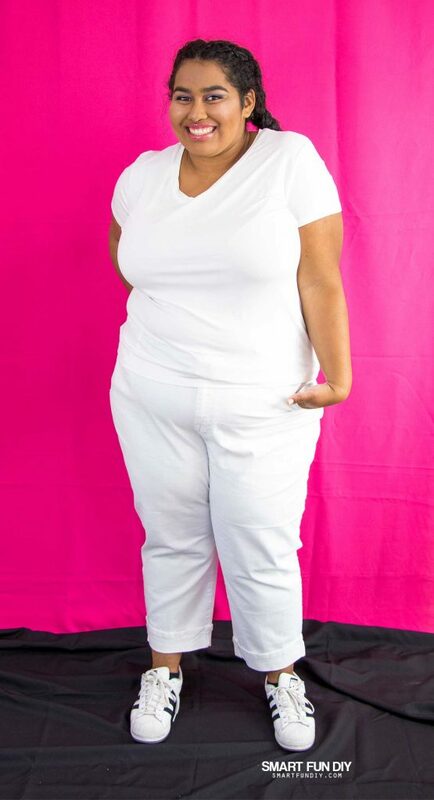 The white clothing items will be what you'e really wearing. This DIY Unicorn Frappuccino costume is essentially a hat and a backwards backpack style sandwich board costume. Measure and mark 15″ out from the center line on one of the short sides. This will be the top of the “cup”. Measure and mark 8″ out from the center line on the other short side. This will be the bottom of the “cup”. Using a craft knife or utility knife, cut along the lines to cut out the cup shape. Use scissors to round the corners a little so they are not poky. Lay the “cup” on both piecee of fabric and cut around the outline about 3″ from the edge of the foam core. 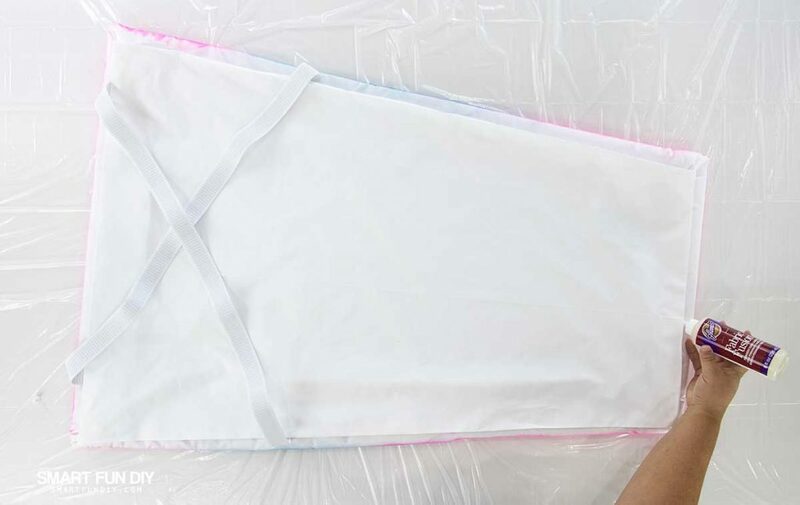 Fold the edges of ONE piece of the fabric over 3.5″ and press flat with an iron. Set aside. Glue strips of roll batting to the “cup” with Aleene's Quick Dry Fabric Fusion Glue. Trim away any batting that hangs over the edges of the foam core “cup”. Lay the “cup”, batting side down, onto the remaining piece of white fabric. Fold the edges around to the back of the foam core board. Hold taut and glue in place with Aleene's Quick Dry Fabric Fusion Glue. You can use a plastic ruler to press the fabric into the glue while it dries. Allow to dry. Go outdoors in a well-ventilated area. Lay the “cup” fabric side up on a tarp or piece of plastic sheeting. Spray the blue Tulip ColorShot Instant Fabric Color across the middle of the cup in a sweeping motion. Next spray pink Tulip ColorShot Instant Fabric Color to make the cup look like a Unicorn Frappuccino. Use a photo for reference. Dip a brush into Tulip Soft Paint in White. Hit the brush against your hand, in a downward motion towards the “cup” to make white splatters. Cut the elastic to 1.5 yards long each. Glue one end of each elastic strip to the top of the back of the “cup” with Aleene's Fabric Fusion Glue, above where the shoulders would be. Allow to dry. Form an X with the elastic strips and glue the other ends to the opposite sides of the “cup”, using Aleene's Fabric Fusion Glue. Allow to dry. Lay the first piece of white fabric, the one cut and pressed into the cup shape, onto the back of the “cup”. Adhere in place with Aleene's Fabric Fusion Glue, making sure to glue the areas around the elastic straps really well. Tie a knot in a piece of string. Push a push pin through the knot and into the center of the small piece of foam core board. Tie a pencil to the other end of the string, about 10″ away from the push pin. Draw a circle onto the foam core using the string and pencil. Remove the string, pencil, and push pin. Cut out the circle. Glue strips of roll batting to the circle with Aleene's Quick Dry Fabric Fusion Glue. Trim away any batting that hangs over the edges. Lay the circle batting side down onto the piece of green fabric. Trim away the excess fabric to about 2″ around the edge of the foam core board. Fold the edges of the fabric around to the back of the foam core board. 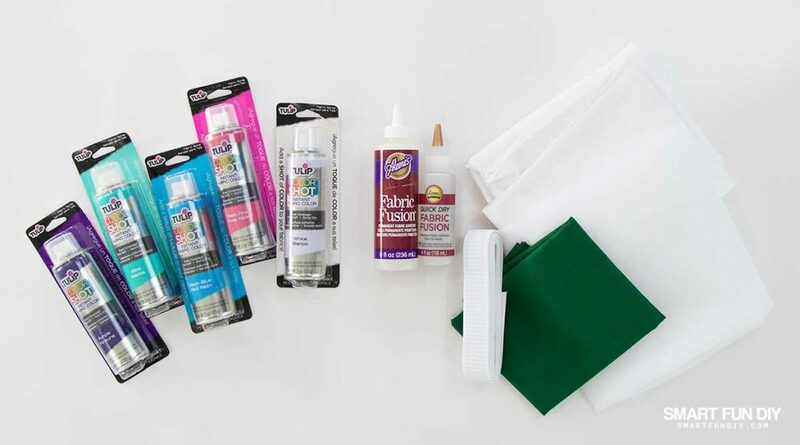 Hold taut and glue in place with Aleene's Quick Dry Fabric Fusion Glue. You can use a plastic ruler to press the fabric into the glue while it dries. Allow to dry. 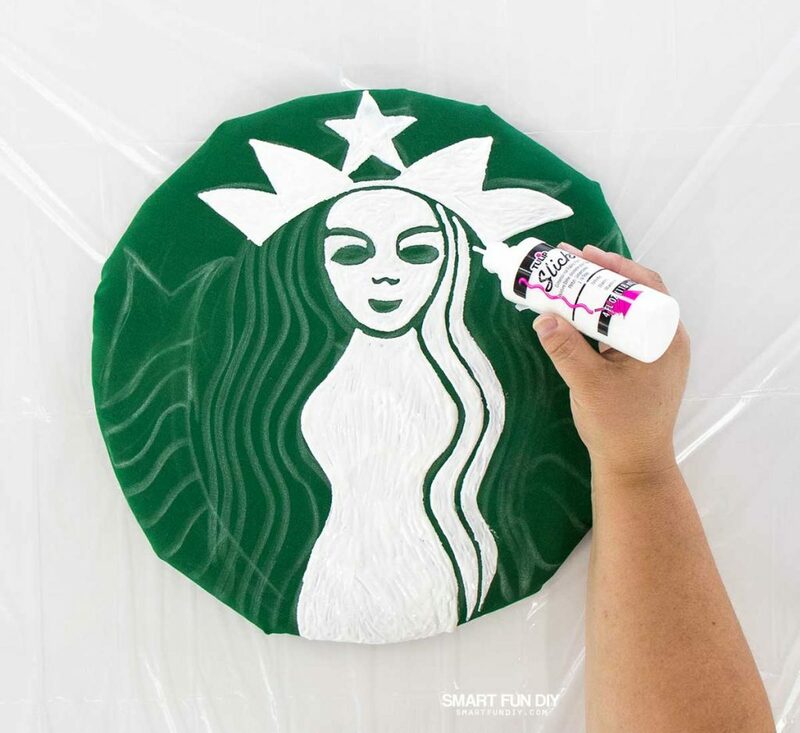 Using a piece of chalk, sketch out the Starbucks logo onto the front of the green fabric circle. Fill in the sketched logo design using Tulip Slick Dimensional Fabric Paint in White and allow to dry overnight. Adhere the green circle to the center of the “cup” with Aleene's Quick Dry Fabric Fusion Glue. If you want this to be removable so you can re-use this costume base to make a milkshake costume later, use self-adhesive hook and loop tape or safety pins. Gently drape the leftover roll batting on top of the white hat. Reshape and fluff to make it look like whipped cream. Wrap the hat and batting in tulle. 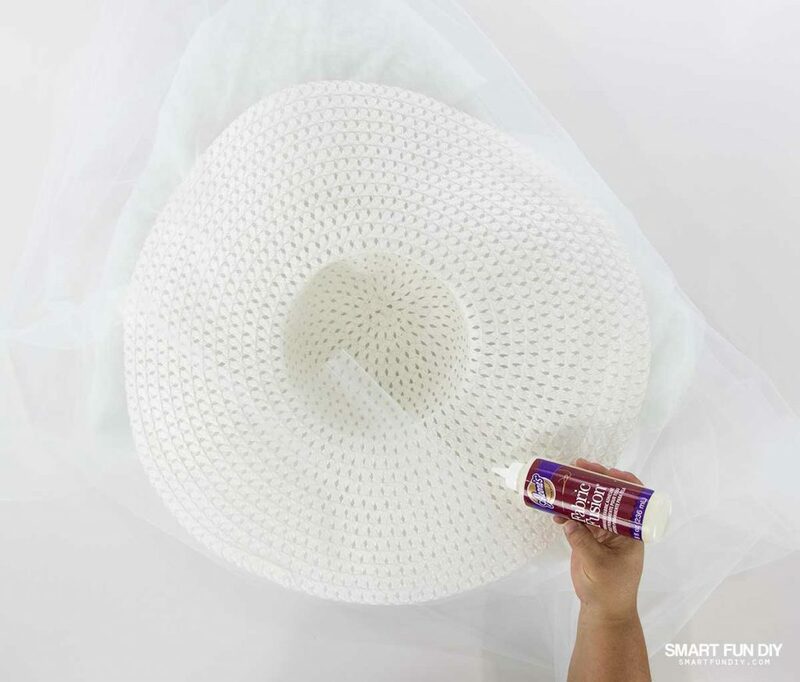 Glue the edges of the tulle to the hat with Aleene's Quick Dry Fabric Fusion Glue. Allow to dry. Thread strips of tulle onto wire. Twist to make tufts, Glue the tufts allover the hat. Wrap the tube with the green fabric to make the straw. Press the end of the straw into the tulle bubble and secure with hot glue. Sprinkle the hat with sequins and adhere in place with Aleene's Quick Dry Fabric Fusion Glue for the “flavor changing sprinkles” on top of the Unicorn Frappuccino. 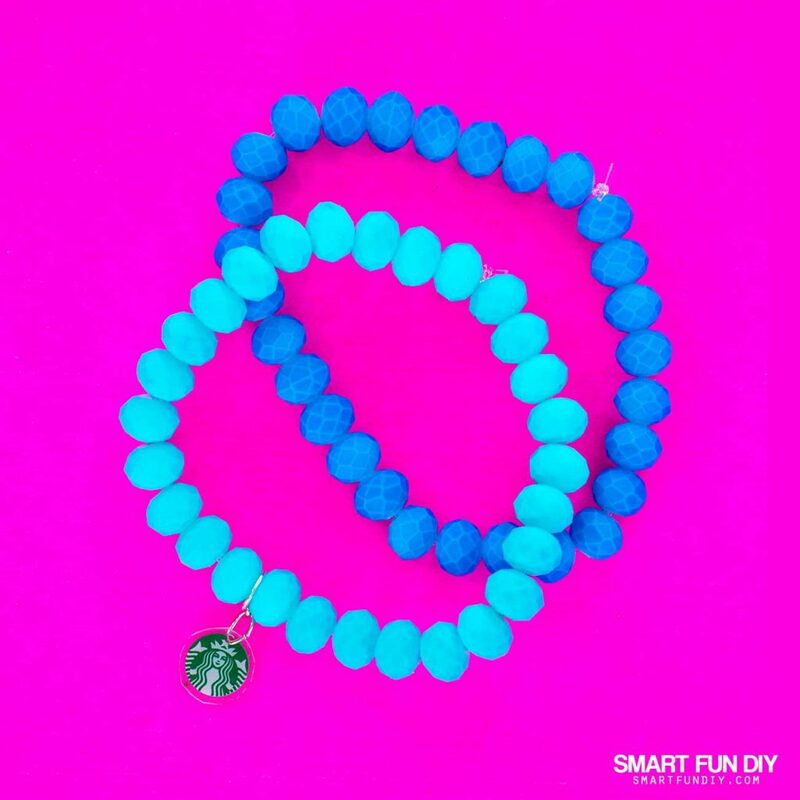 These DIY Starbucks charm bracelets are so cute and easy to make. After Halloween is over, you can wear them as you drink your fave Frappuccino. Cut out the Starbucks logo from the gift card. Punch a hole in the gift card. Thread on 3 jump rings to create a charm. String the beads on the elastic thread. At halfway, thread on the charm. Continue filling the thread with beads until the length fits your wrist. Tie the ends of the thread off in a square knot and trim. Repeat to create each bracelet. Put on your white shirt and bottoms (pants or skirt with tights). Put your arms through the elastic straps of the cup panel, like putting on a backpack backwards. Slide the bracelets on your wrist. 7 tricks to make your DIY Unicorn Frappuccino costume OVER THE TOP! Unicorns need unicorn hair! This gorgeous cascading blue and purple wig is great for unicorn hair or mermaid costumes. Add a unicorn horn. Wear a unicorn headband or make your own. 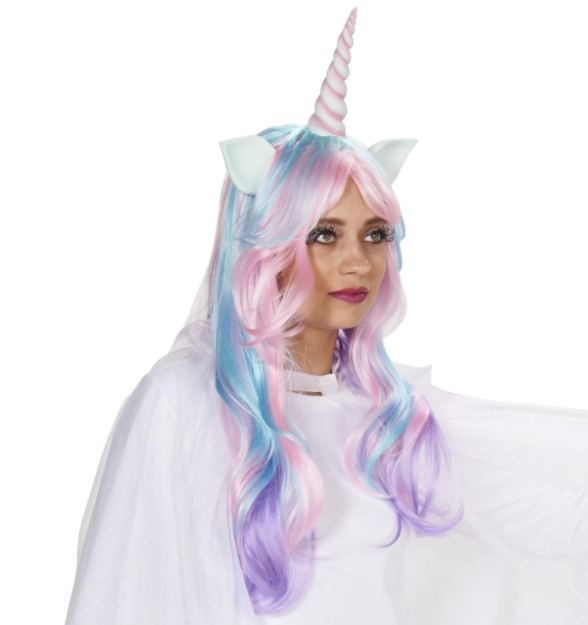 Grab this unicorn wig combo with the horn already attached! DIY your own unicorn makeup. And take it up a notch with unicorn body paint! Make it girly. Wear a white skirt with leggings or tights instead of jeans or pants to make this costume even cuter. Add glitter! Spray the whole costume with glitter spray to make it even more MAGICAL! Be a unicorn cannibal. Yikes! 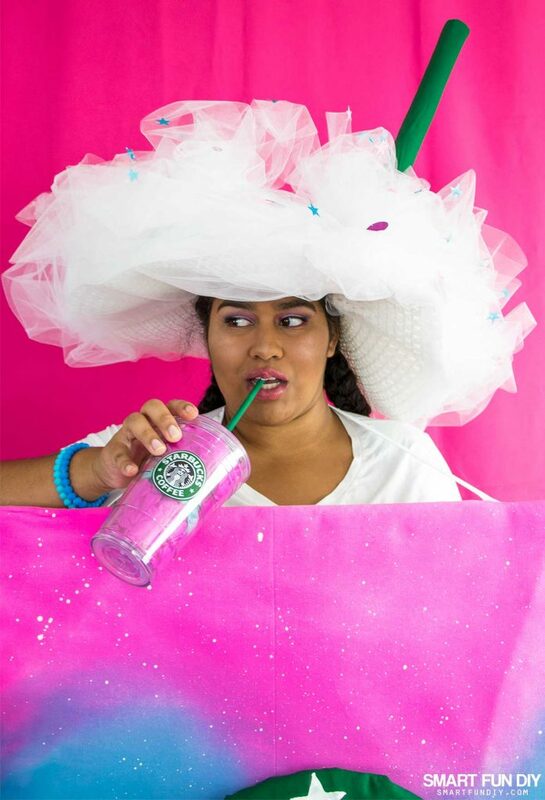 I mean, it IS Halloween … make a statement by creating a faux Unicorn Frap to hold as part of the costume. Start with this! 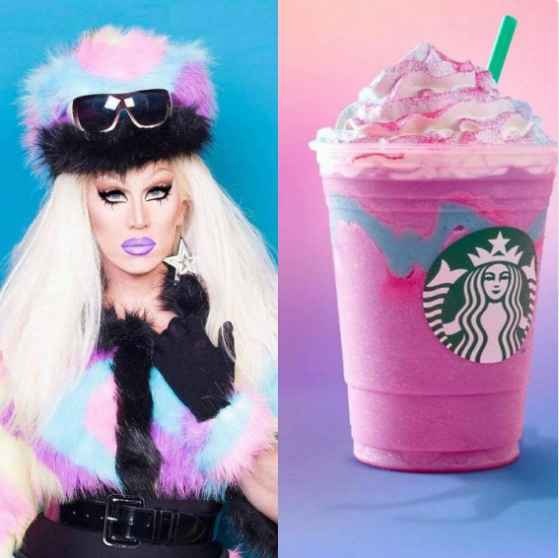 A Unicorn Frappuccino drinking a Unicorn Frappuccino?! Order them all. Who says you have to choose between tall, grande, venti, and trenta? 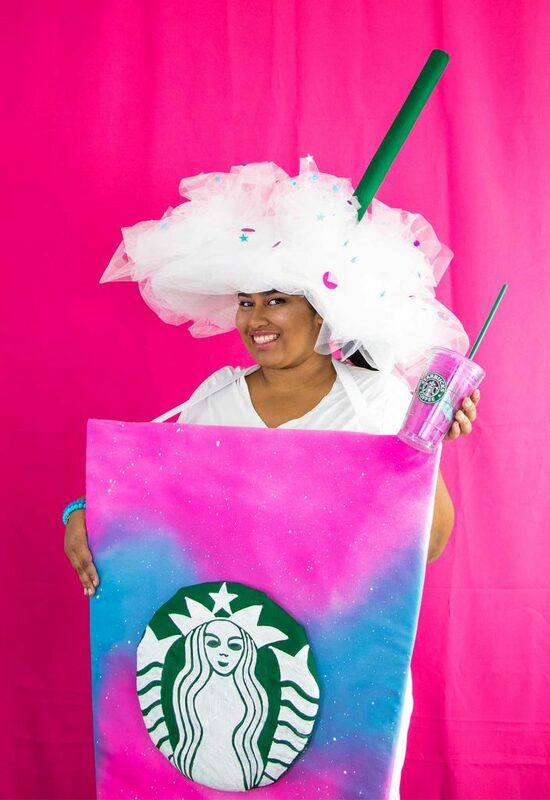 Make a family of Unicorn Frappuccinos by creating this costume in different sizes for the whole family or your crew. What a clever idea for a costume! Thanks for sharing at our Party in Your PJs link party! This is so creative and cute!!! !